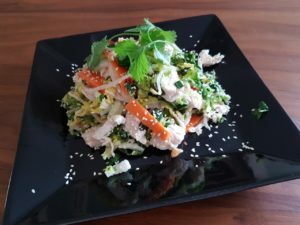 A fresh and fragrant chicken salad. Prepare the above salad ingredients and put into a salad bowl. Place chicken in a baking tray and then half fill the tray with water. Add salt and kaffir limes leaves (torn up a little to release their flavour). Let sit for about half an hour. Then transfer the tray into a pre-heated oven and bake chicken at 180 C for approximately 35 minutes or until cooked through. In the meantime, make the dressing. Add all ingredients into a screw top jar and shake well until combined. Once the chicken is cooked, shred into thin slices. Add to a bowel with prepared salad, top with desired amount of dressing and lightly toss. Garnish with some extra sesame seeds and coriander.